The Boot Inn Willington – Definitely worth a visit! Nice weather, nice company, nice area and fully equipped with the correct quality walking gear, (supplied by Cherry Tree Country Clothing, of course!!). So, what could be better! So where did we go? Well, we took ourselves over to Willington, near Tarporley! A great decision as it turns out! There are many routes that can be taken which are all clearly signposted but what struck us as fascinating was the deposits of sand along the way – well, after all, we were on part of the Sandstone Trial which is a 55 kilometre long walkers’ path that stretches from Frodsham down to Whitchurch. Willington, and its surroundings, really is an area of natural beauty and it’s easy to see why it is often referred to as Little Switzerland. Depending upon which way you decide to venture, you will find the wonderful Willington Hall Hotel, which was built in 1829, and became a listed building in 1958. It looks like a great place to stay! Further towards Primrose Hill Wood, we found a delightful Tearoom named “Summertrees”, which is great for homemade cakes, scones, drinks and delicious hot and cold snacks! 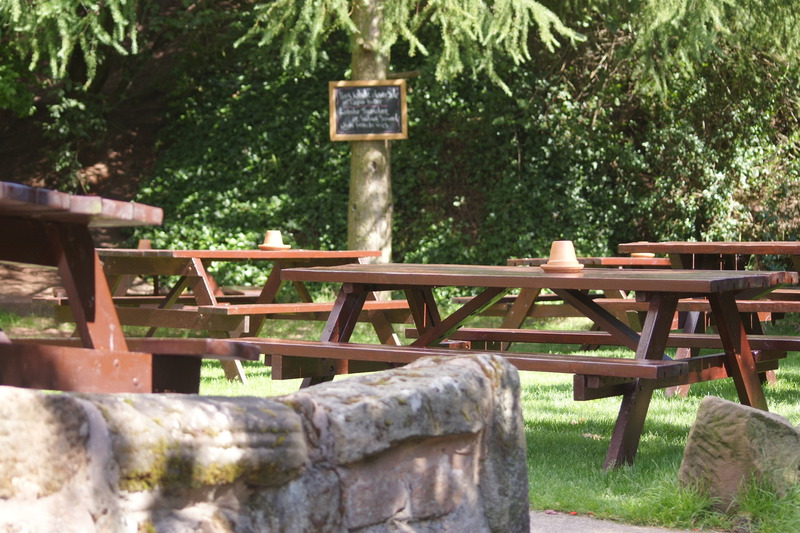 We also found The Boot Inn which is a picturesque real countryside-type pub, with a fantastic menu of great food that would tempt anyone – especially after a long, healthy, enjoyable walk! (You can look up The Boot Inn Willington at grid reference SJ 531 672). Plus, The Boot Inn welcomes dogs! There is also a lovely fruit farm and Farm shop in Willington, run by Winsors – great for plants, farm produce and their own pressed Apple Juice. All in all, visiting Willington is a great way to spend some time outdoors. Willington and its surrounding area really is worth a visit! Remember for long walks, you will need to equip yourself well. Please feel free to contact us at Cherry Tree Country Clothing for advice on what to wear for comfort, safety ….. and indeed style! Alternatively, please visit our website. Do enjoy the great outdoors! Check out the gallery below for more fantastic countryside views! Sandstone Trail – Secret passage way! Is there much in Much Wenlock?